I drew in an audible gasp as the results populated on my laptop screen. A search for homes to rent within our budget returned fewer than five listings. My heart fell when I realized all but one were located more than 20 miles from our next duty station. “This can’t be right,” I mumbled, looking at my husband for some sign of reassurance. Several hours and lots of disheartening research later, we realized we were moving to an area with a particularly high cost of living. We were going to have to get creative to make our tight military family budget work at our next duty station. Are you struggling to make ends meet at an expensive military installation? 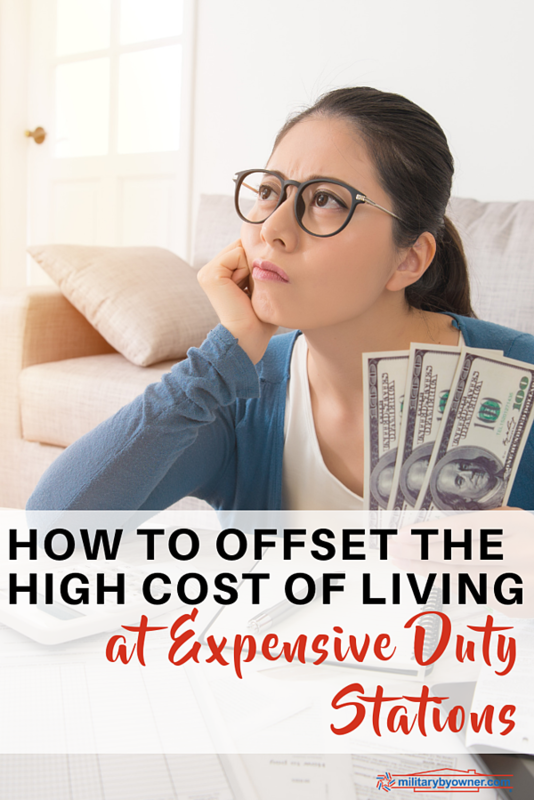 Here are five real ways to offset a high cost of living. 1) Reconsider your housing options. Instead of forfeiting your BAH for base housing, consider researching trends in the local housing market. Purchasing a house now to rent to another military family later may be a smart investment if you are prepared to do so. If not, seriously consider downsizing to a townhouse, condo, or apartment to give yourself a little bit of cushion in your monthly budget for extra expenses. In our most recent PCS, we moved from a roomy four-bedroom house to a two-bedroom apartment. It required a perspective shift, plenty of patience, and some imagination, but we’ve discovered many unexpected silver linings in the smaller space. I’m especially thankful for fewer rooms to clean, zero yard work, and awesome amenities (hello, swimming pool and hot tub!). 2) Sell what you don’t need and purchase used. Once you’ve downsized, sell any excess household goods and stash your earnings in a savings account in preparation for your next military move. Still need a few items? Browse local secondhand stores for necessities like gently used clothing, housewares, and furniture before buying new. We were able to swap a pile of unused toys for sports gear, trading less clutter indoors for more fun outside. Win-win. Sit down with your spouse and take a good hard look at where you money is going each month. Be honest with yourselves. Are you spending too much on technology? Shop around for the best bargain cell phone and internet deals in the area, and consider switching from cable to an inexpensive streaming video service like Netflix or Hulu. Do you eat at restaurants several times a week? Scour the internet for inexpensive, quick and easy meals, learn how to make your favorite coffee beverages at home, and collect coupons like they’re going out of style. Instead of allowing this process to overwhelm us, my husband and I view cutting corners as a challenge to take on together. Game. On. 4) Get a side hustle. One of the best ways to offset a high cost of living is to increase your earnings with multiple income streams. Ask yourself, “What are my gifts and passions? How can I best use them to support my family during this season?” Babysit, sell handmade items, or consider offering a service like cleaning homes or mowing lawns. My passion for freelance writing has been a blessing during this time of corner-cutting and penny-pinching. It’s provided me with a real way to add to our family’s finances when we need it most. 5) Get creative with entertainment options. Chances are, your duty station has a high cost of living for a reason: Everyone wants to live there! Find ways to enjoy local sights and attractions while you have the opportunity--without blowing your budget. Take advantage of local military discounts and purchase annual passes to your favorite local parks and museums so you can pay once and enjoy the activities all year long. Purchasing a membership to a local children’s museum was a smart move for our family. It gives us a fun option on the weekend when we’re itching to get out of the house; we’ve been so many times already, it has more than paid for itself. As the end of the one-year lease on our tiny apartment draws closer, my husband and I sit down at the computer together to consider our housing options once again. “Are you ready to move into a bigger place?” I ask. I look back at the screen, eyeing a particularly lovely, but ridiculously expensive three-bedroom home. “Me, too,” I sigh, and I mean it. I’m proud of the adjustments we’ve made to keep our family finances afloat in a high cost of living city. Remember, the changes you are making right now are not long-term adjustments to your lifestyle. Take a deep breath, and find a way to be content with what you have in this current season of military life. You’ve got this!